ItemE-02614 - The Granby wharf at Ladysmith. ItemE-02621 - "First Avenue, Ladysmith." ItemE-02635 - "Commercial Street, Nanaimo, BC." ItemE-02639 - The hollow tree in Stanley Park, Vancouver. ItemE-02640 - "Victoria Male Voice Choir, 1908, J.M. Morgan, Conductor." ItemE-02642 - John Renfree and others at the back of the E.G. Prior and Company establishment, Victoria. ItemE-02651 - Part of Dixon's "Chart of the NW Coast of America of 1878"; the first map to show the Queen Charlottes as a group of islands. ItemE-02652 - The Andrew Haslam home; Nanaimo. Item E-02640 - "Victoria Male Voice Choir, 1908, J.M. Morgan, Conductor." 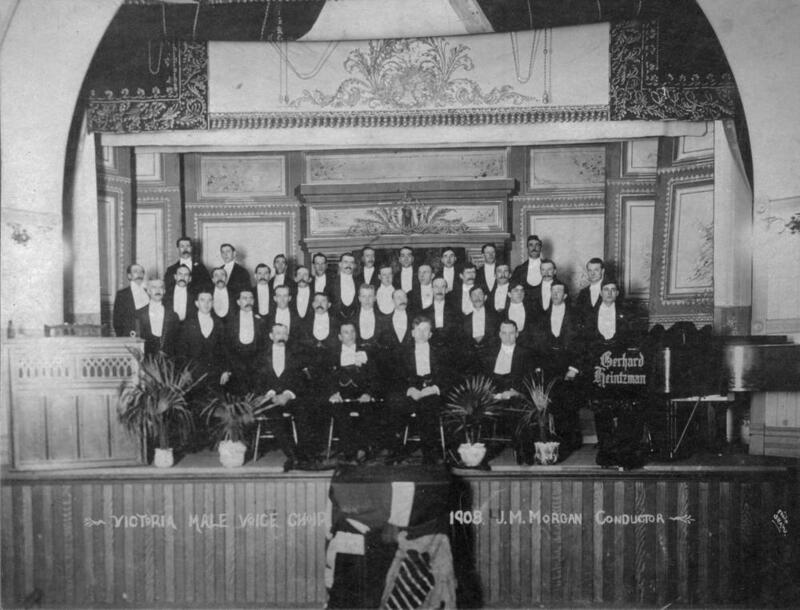 "Victoria Male Voice Choir, 1908, J.M. Morgan, Conductor."